What is the Garaga Experts network? 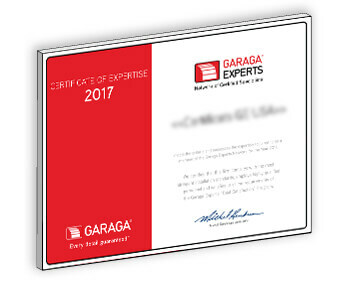 We are proud to have met the criteria for excellence that led us to be invited to join the Garaga Expert network. The performance and durability of a garage door depend as much on the quality of the installation as on that of the product. That is why Garaga set up Garaga Experts, a network of installers who have passed a rigorous selection process so that our customers can be assured that the installation of their garage door is made by true specialists. A professional service that is second to none. The peace of mind of an impeccable job. A securely-installed door, with no detail overlooked. An advisor to help you make the best choice corresponding to your needs. A promise of stability throughout the lifetime of your Garaga door, assuring you of attentive service if adjustment or maintenance is needed over the years. With Garaga Experts, you get "Quality Work...Time After Time"! Members of the Garaga Expert network know Garaga products like no one else because they meet annually with the manufacturer to perfect their knowledge. Thus, we can help you make an informed choice as to the appropriate type of door, the energy efficiency requirements, the choice of models and colours, etc. We are able to give you the latest information on accessories, hardware, door openers, and safety devices. The Garaga Expert basic warranty is one of the most comprehensive and reliable in the industry. Our limited warranty covers the door, the Dura+ hardware, the weatherstripping as well as the door opener sold by Garaga, when the installation was made by Garaga Expert specialists.